will be met with frequently by the student. The bedstead on Plate VIII. is dated 1615, but bears evidence of reconstruction. 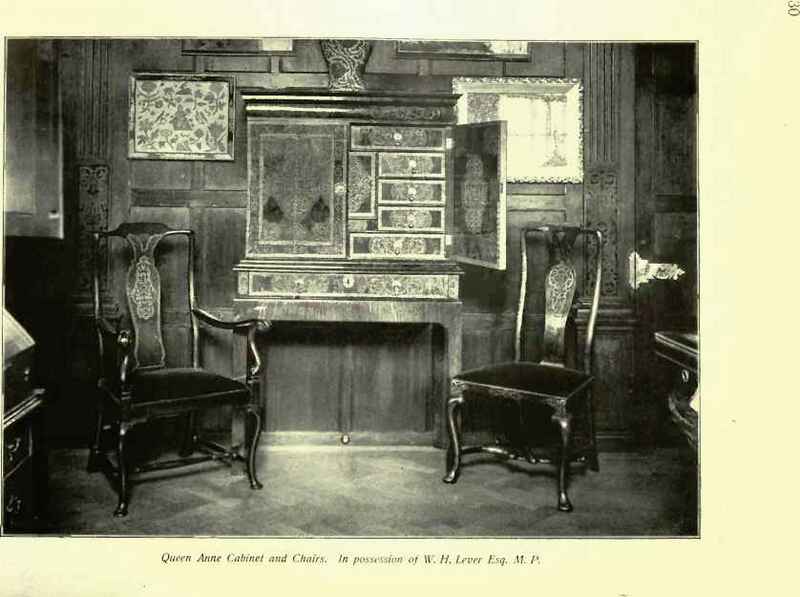 Indeed, it is not improbable that the panelling at the foot was originally made for a chest. Piecing-together of this kind was not at all uncommon. The two arm-chairs on Plate IX. bring us to the " Shakespeare" type again, and might, perhaps, be more fitly described as " Elizabethan" rather than "Jacobean," though, so far as style is concerned, either description would apply. The stool on Plate X. may be put down as seventeenth-century German work, and partakes strongly of the Gothic feeling. 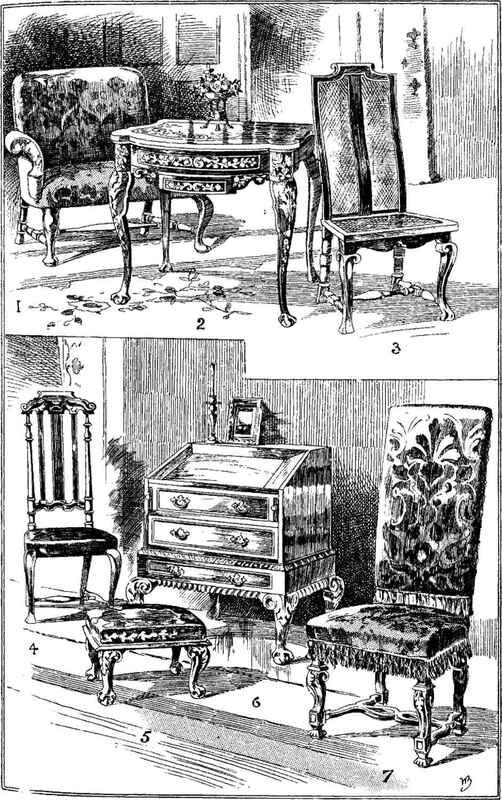 The two chests on Plate XIII. are reproduced by permission of their present possessor, Mr. Jas. F. Sullivan—"Jassef" as he delights to sign himself in his merry conceits—and are pieces to excite the spirit of envy in the breast of the collector. The first, dated 1607, shows how early in the century the Flemish influence was at work in this country, while the second almost reconciles us to the introduction of Gothic detail into domestic furniture. On Plate XIV. we have a delightful grouping of fine old "Jacobean" forms in a modern house. That the effect is artistic in the extreme is not surprising, for the subject of this plate is in the dining-room of the home of Mr. Robert Sauber, R.I., R.B.A. As we pass in review the successive changes that have taken place in the applied arts of most countries—and in the applied arts I, of course, include the art of furnishing—it will generally be found that under normal conditions the development of old styles, and the formation of new, have been gradual and evolutional, the characteristics of the older styles growing weaker and those of the new-comers stronger by degrees, until the former have been completely absorbed in, or supplemented by, the latter. This phase of the question is one of the first to present itself to the student of decorative art, and is forcibly illustrated by the work of all ages. There sometimes occur changes which, when they are first encountered, appear to constitute striking exceptions to the general rule; but further investigation will lead to the discovery that they are not really exceptions, but simply represent other offshoots from the parent stem. So it is with style in furniture. By analysing and comparing all that was best and most characteristic in the creations of the Elizabethan and Stuart epochs, we have now, I think, gained a complete and just conception of the work of the days which led up to the period we are now about to consider.